Soup is the perfect comfort food, especially on cold winter days. It’s also the perfect meal for a busy family that doesn’t have time to sit down for a meal. Soup is always our “go to” meal when we have a night packed full of practices or meetings which happens a lot. It was one of those kind of nights. Time to make some Italian Sausage Spinach Soup, leave it on the stove, and eat at your convenience. Italian sausage is used in this house at least once a week. I love Italian sausage! It probably has something to do with my Italian heritage, but it also adds so much flavor. 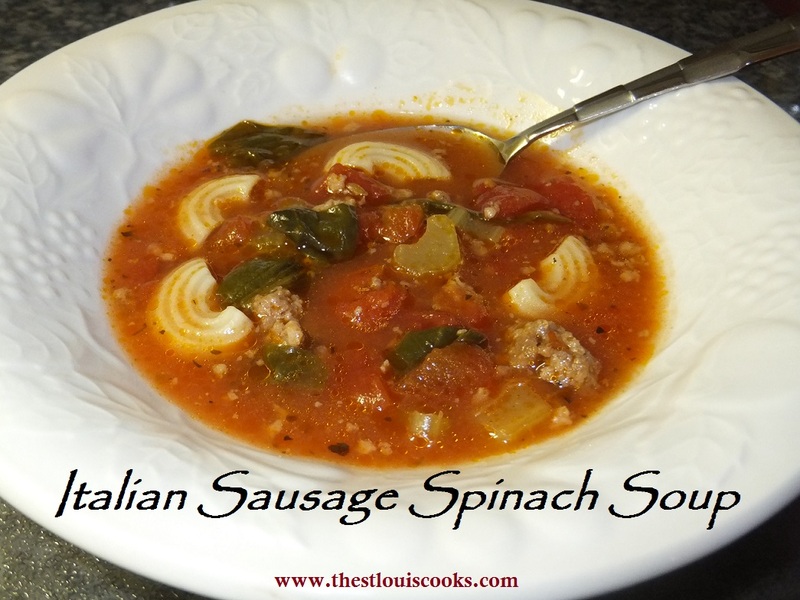 You can taste the extra bold flavors and spice of the sausage in this awesome Italian Sausage Spinach Soup. This soup is also very versatile. If you are looking for a low carb option, then leave the pasta on the side. My husband eats the Italian Sausage Spinach soup with out the pasta. The kids enjoy it with the pasta so everyone is happy. Of course, we double the recipe because we like left overs. Italian Sausage Spinach Soup is a favorite in this house. Check it out! Heat a large soup pot over medium heat. Add the sausage to the pan and cook. Stir the sausage, breaking it up to crumble for approximately 10 minutes, or until browned. Drain, and return to the pot. Add broth, tomatoes, celery, pasta, Italian seasoning, salt, and pepper to the pot. Bring to a boil over high heat. Cover, reduce heat and simmer for 20 minutes, or until pasta is done. Remove from heat and stir in spinach until wilted. Sprinkle each serving with fresh grated parmesan cheese. Serve with hot Italian bread! Optional Low Carb – If you want to add the pasta separately, prepare pasta according to package directions. Do not add pasta as indicated in step 2. Leave the pasta on the side. It can be added individually to each serving. Another note, we used a larger shell pasta because that is what we had at home. Remember, you can get a little creative and adjust accordingly to what you might have in your kitchen. « Education 4 All, Inc.